– Malaysia, Singapore, Brunei, Thailand, Myanmar, Philippines, India, Hong Kong, Indonesia, Australia, New Zealand, United Kingdom, Ireland, France, Germany, Italy, Switzerland, Malta, Poland, Czech Republic, Slovakia, Austria, Greece and United Arab Emirates.. In 1998, we joined the International Catholic Programme of Evangelisation ( ICPE www.icpe.org ), a Catholic lay association with Canonical Pontifical Recognition, based in Rome. From 1999 2001, we were based in Malta, Europe and brought the Gospel to the people of Europe. In December 2001, we moved back to our home in Kuala Lumpur and now from Malaysia, we bring the message of Jesus, the Prince of Peace throughout Asia Oceania. Ø Age - Jude : 42 years old / Veron : 42 years old. Ø Jude - professional career : Banker with United Malayan Banking Corporation for 11 years. Ø Veron - professional career : Secretary / Personal Assistant in Volvo Malaysia for 15 years. Ø Jude begun a personal relationship with God in 1981. Ø Veron begun a personal relationship with God in 1983. Ø Jude - active in Catholic Charismatic Renewal since 1983, leading St. Joseph prayer group in Kuala Lumpur. 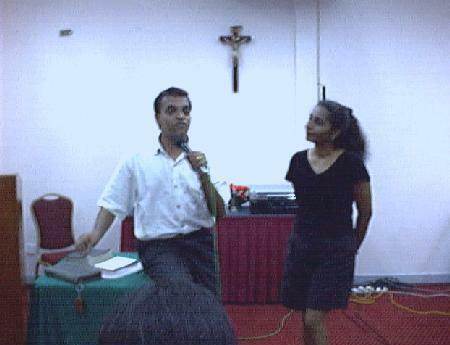 Ø Veron active in Catholic Charismatic Renewal since 1984,leading Our Lady of Lourdes prayer group in Klang. Ø Jude & Veron - served at various levels of leadership in Catholic Charismatic Renewal, from prayer group leadership to Diocesan Service Team, since 1983 - 1994. Ø Jude - musician, singer and song writer; composer of Renew Me, O Lord 1989. Ø Jude - directing the Youth Evangelisation School ( YES ) from 1993- 1998. Ø Jude began full time pastoral ministry in 1994. Ø Veron began full time pastoral ministry in 1998. Ø Jude involved with the leadership of Kuala Lumpur Archdiocesan School of Evangelisation ( WET Working Evangelisation Team ) from 1993 1998. Ø Jude co-founder of WORKERS FOR THE HARVEST a Catholic alliange of evangelistic ministries within Asia Ocenia geared towards mobilising 10% of Catholic worldwide into short term missions. Ø Jude member of the Youth Arise International ( YAI ) International Council YAI is a Catholic initiative promoting world wide youth evangelism and discipleship. Ø Jude & Veron founders of Partners in Mission ( PIM ) - a network for lay Catholics interested in supporting and participation in short term missions. Ø Veron - member of Mother's Prayers an intercessory ministry for mothers based in United Kingdom. Ø Jude worked in colloboration with International Charismatic Consultation on World Evangelism ( ICCOWE ) - an ecumenical body with a heart for evangelisation, since 1996. Ø Jude & Veron joined International Catholic Programme for Evangelistion ( ICPE ) full time since August 1998, in Wellington, New Zealand. Ministered as a family in Malta, Europe with the ICPE Malta Mission Centre from 1999 2001. Ø Moved to Kuala Lumpur, Malaysia in December 2001.